George Billis Gallery LA is pleased to present the gallery's fifth solo exhibition of work by Daniel Phill. The exhibition features the artist's recent paintings and continues through June 28th. Daniel Phill reconstructs nature; attempting to find order in what appears to be chaos. Plants, flowers and vegetation appear and vanish into the picture plane, often submerged under layers of pigment and washes. 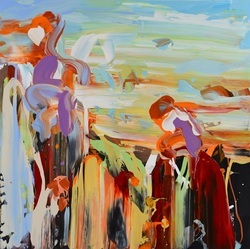 A fluid application of paint, using non-traditional painting tools, contributes to achieve results which are intensely colorful and often sensuous. In each painting, the artist’s use of color dramatizes the illusion of space and light to produce an ambiance full of both energy and serenity. He seems to deconstruct the natural environment, to then reconstruct it - using an improvised painterly expressionism. Through gesture and perception, Phill creates work that is both organic and unrehearsed. Daniel Phill received an MFA from Stanford University in 1983 after completing his BFA at the San Francisco Art Institute. He has exhibited extensively across the U.S. Daniel Phill has been featured in many publications, including: Wall Street International, ARTnews magazine, Art in America magazine, California Home+Design magazine, New Yorker, Los Angeles Times, Art & Antiques Magazine, and Who's Who in the West, among others. Daniel Phill's work is in diverse public and private collections, including: Fine Arts Museums of San Francisco, Tucson Museum of Art, Haggerty Museum of Art, de Saisset Museum, Citigroup, Clear Channel, Ernst & Young, GTE, Kimberly Clark, Morgan Stanley, Nordstrom, Pfizer, Sharper Image, Sprint, Stanford University, and US Department of State, among others.